Few surely predicted that come the end of the year the biggest heavyweight fight in world would not feature Anthony Joshua. British boxing’s golden boy is set to headline a sold-out Wembley Stadium once again when he defends his catalogue of world titles against Russian Alexander Povetkin next month. But having failed to do a deal for a unification with Deontay Wilder, who as the WBC’s champion has possession of the other major belt in boxing, the American has moved on. The brash former Olympian will take on none other than Tyson Fury, with details to be confirmed on a fight that is set to take place in Las Vegas in November. If the face-offs in Belfast at the weekend are anything to go by the build-up will be colourful and potentially not fit for a family audience, while the fight itself has all the hallmarks of being an explosive one between two of the most colourful characters in a sport that is hardly shy and retiring. Fury is only two fights into his comeback after nearly three years out of the ring, a catalogue of issues having threatened to derail his career after his landmark win over long-time ruler Wladimir Klitschko in Dusseldorf in November 2015. 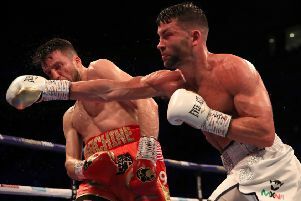 His opener against Sefer Seferi in June was more farce than fight while he cruised through his contest against Francesco Pianeta at the weekend as he looked to bank rounds knowing what was around the corner. Reports on his return to the ring suggested the 30-year-old wanted more than a couple of tune ups. But this is an opportunity too good to turn down, offering the self-proclaimed “Gypsy King” a remarkable shot at redemption. Billed as the “lineal heavyweight champion” Fury will also enjoy making Joshua something of a sideshow in the weeks and months to come. hitter heads across the pond. But how close is this Fury, under new trainer Ben Davison, to the one that ended the 10-year unbeaten streak of Klitschko? That is the question that matters more than any other. Having built a fearsome reputation with highlight-reel knockouts against limited opposition, Wilder has won over many sceptics by seeing off Cuban veteran Luis Ortiz last time out. The 32-year-old has the potential to be outboxed but knows that his best chance of beating the 6’9” Lancastrian comes now, rather than in a few months’ time. He will also back his punch power over Fury’s. Wilder hits hard, very hard, which is what makes him must-see. Strap in – it’s going to be some ride.